The Wonderpus octopus, Wunderpus photogenicus, a newly described species of octopus, is an amazingly beautiful species of octopus, and a favorite underwater critter for muck-diving underwater photographs to photograph. The Wonderpus octopus was not officially described until 2006. Wonderpus octopus from Secret Bay while diving Anilao. This beautiful example of marine life has to be seen in person underwater while diving to fully appreciate. Thanks to Christine Huffard for confirming my octopus id. Christine is the most active researcher of the Wonderpus Octopus. 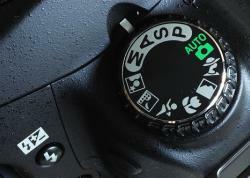 Taken with Nikon D300, 60mm macro lens, dual strobes at F11, 1/250th at 3PM, 30ft of water. Their official range consists of the area bordered by Vanuatu, Papua New Guinea, Indonesia, Borneo, and the Phillipines. Their diet consists of small crustaceans and small fish. The habitat of the Wonderpus octopus consists of open areas of sand, often black sand, where there are few places of refuge. They live in burrows in the sand. 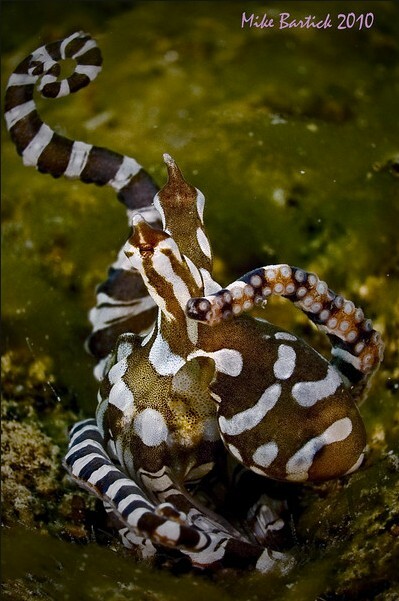 The Wonderpus octopus is often confused with the Mimic Octopus. The wonderpus octopus has fairly uniform white markings that lie on a solid rusty-brown body. Notice how the rusty-brown body in my photography is fairly uniform and solid. The Wonderpus does not mimic other species like the Mimic does. Total length of the Wonderpus octopus is usually 15-25cm. 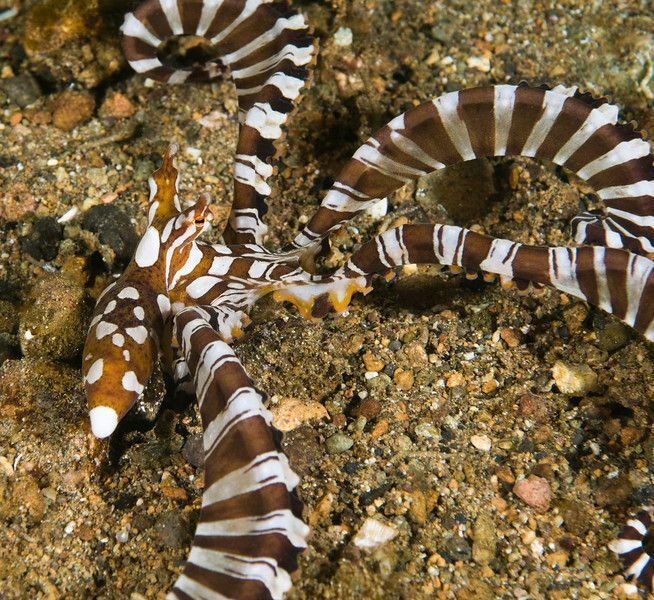 A study has been done in Lembeh to see if Wonderpus octopus can uniquely identified by their white spot patterns. The study shown that most people can identify unique individuals to a high degree of certainty, but interestingly some people were much better at this than others. There's a link to the paper in the comments below. If you have a photo of a wonderpus octopus, consider submitting it to the Wunderpix online database. The Wonderpus octopus is most active early morning, or late afternoon (dawn & dusk). 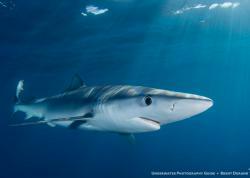 They are less commonly seen in the middle of the day or night. Do not rapidly approach the octopus, or get too close - they can quickly bury themselves in the sand. Observe them at first from a distance and they will reward you with remarkable behavior. 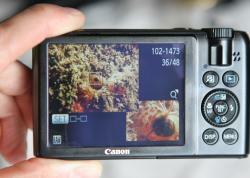 When the Wonderpus is alarmed, it gives a warning display similar to what you see in my photo above. Backup and give the octopus space so you can watch it continue to forage or find a mate. The Wonderpus is often seen in 20-40ft of water. While I was researching Wonderpus, I was surprised and shocked as to how often it appeared in people's aquariums. It's difficult enough for a diver to find one of these uncommon critters. There's most likely an entire army of people out there trying to capture unique marine life to put into people's aquariums. I'm not saying I'm against aquariums but I hope this can be done responsibly so that we don't endanger our marine resources even more than we have been. Submitted by Guest (not verified) on Fri, 2012-01-27 05:08. Submitted by Anonymous (not verified) on Tue, 2010-03-09 18:53.